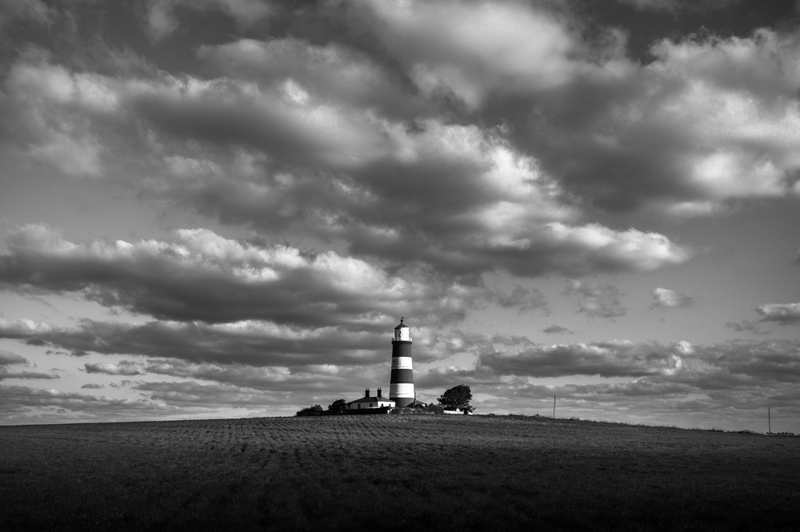 Happisburgh Lighthouse (pronounced ‘Haze-bruh’) is the oldest working light in East Anglia and the only one in Great Britain which is independently run and maintained through voluntary contributions. Built in 1790 and originally one of a pair, the lighthouse is 85ft tall and the lantern is 134ft above sea level. It overlooks the dramatic North Sea coastline which is constantly under threat from coastal erosion, and to this day threatens many seaside homes. Interestingly the lighthouse was painted in bands in 1884 after the second lighthouse was demolished in the previous year. This was to distinguish the Happisburgh lighthouse from the tower at Winterton, a short distance along the coast. Having enjoyed a good late afternoon walk along the beach, I drove from the car park back towards the centre of the village before turning into the lane which leads to the lighthouse. I was keen to see whether or not there was a good view with setting sun behind me. Standing proud on the hill, with the low angled sun light illuminating the field in the foreground, I was able to capture this image. I couldn’t have been more fortunate with the cloudscape, which provides a lovely backdrop to the main event. Delightful how light appears to have created a natural gradient from the base of the image towards the lighthouse. The Beachy Head light house is similarly banded. Thanks Andy. I have photographed Beachy Head lighthouse as well. There is something appealing about them.